Note 1: Sydney FC's second goal came after a incorrect offside decision that allowed the goal to stand. Bernie Ibini clearly held and impeded the vision of Ante Covic but neither the assistant referee or referee saw a foul. Romeo Castelen got the last touch that deflected the ball past Covic. Note 2: Vitor Saba was given a straight red for a lunging but otherwise clean tackle that got the ball. Note 3: Vedran Janjetovic spilled the ball into his own net after a shanked clearance fired it high into the air. Note 4: This match received the highest ratings for a regular season A-League fixture on Foxtel, with 175,000 viewers. Note 5: The crowd of 41,213 was a record Sydney FC crowd for a regular season fixture and their 2nd highest ever after the 2005/2006 Grand Final. It is the 13th highest crowd of all A-League matches and 4th highest excluding Finals series matches. Note 6: Milestones reached in this match include Ante Covic (70 all competition appearances), Mark Bridge (55 A-League appearances & 20 all competition goals), Kwabena Appiah (25 A-League appearances). Manure head GA could just be seen on Channel Noin. 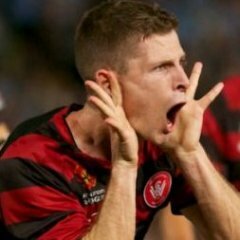 He had to say that the WSW will be too distracted to win the derby because of the ACL final. He also said that he "knows, because he's been there before himself". Huh? Hahahahahaha. No, Arnie, you haven't been there before. Not even close. You are scared shitless of the WSW, that's what I am saying. And I am saying: only two more sleeps, then the Smurfs get pumped. We will be set up very conservatively. Hope to get to the break 0-0 and knick one 2nd half. Santa on his own ploughing a lone furrow. Midfield of La Rocca and Matteo centrally, Bridge, Kubi and Labinot the only ones pushing forward to support Santa but main job being to track back. Hope I'm wrong, love to see a start with Romeo and Saba (and Tomi) but it's not what we're used to right? Just got to hope Romeo and Vitor will make an impact when they come on! Uncle Goat. I hope you are reverse jinxing us. Either way we will all sing louder. I think the squad won't start firing in the A league for a while. When it does it will be a lot of fun. @Wandererstragic @srod009 @WSWFCNews @wswanderersfc How's that? please for the love of God don't start Kubi. Sweet Jesus it is beautiful. I'll be in Alexandria at lunch time. Which pub will Wanderers fans be meeting at near the stadium? What time approx will the march depart Belmore Park? The pub in fox studios, Fox & Lion I think its called. Are there gonna be Wanderers at the Aurora (that's what it's called right?) where we've drunk before previous Allianz games? Tomi no longer number 9? he's 11, Santa is 22 and Ruka is 12. Black shorts? White shorts would have more contrast. We lose when wearing white shorts. Why does everyone have one leg? Also our shorts look a lot tighter than theirs. And the goalies are 8-year-olds? When Ante was 8 he was probably bigger than most of us are now. it has been scientifically proven that time moves slower during derby week. hurry up and get here saturday! Can't wait to see their faces. so according to this Tommy is available for tomorrow. Has been posted a few pages back! They messed up the players' numbers is all. They had Haliti as #6 and Santa as #22 last week as well, they haven't changed as far as we know. Strange build up for me this one, soooooo busy at work (shouldn't be making time for positing this, but anyway) I am going in to work tomorrow and will go straight to the game from work............. then back at work Sunday morning............. ho hum..... pays the bills I guess. But not so much beer and so on for me. I can't wait for that moment when the teams walk out the tunnel and it erupts.